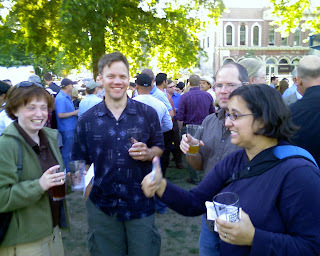 The Brewers Dinner, annual benefit for the Oregon Brewers Guild, is a fun kickoff to the Brewers Festival. Some highlights: Rogue Imperial YSB, Oakshire (formerly Willamette) IPA, Bridgeport Hop Czar from the firkin. Good times, have fun at the OBF! I thought I was cool to do live blogging, but people that can live comment are way beyond my skillz. Blog on, brother. Live blogging is where it is at.